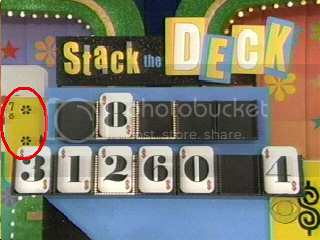 I know this is a bit trivial, but has anyone else noticed the error on the main gameboard of Stack the Deck? It seems that all other occurrences of the yellow, Price-themed cards that adorn the main gameboard and Grocery Product podiums have the correct number of pips. What would be the reasoning for making an error like this? Or is this just to see if the typical "Loyal Fan and True" is paying attention? I believe it was designed so part of the card is covered as it would be in real life (i.e. place a big object over any 7 in the deck, turned upside down where 5 of the suits are upside down, in that position -- you'd get a similar result -- think about it ). Now, I'll see your $50 bet and raise the pot....you're holding a 7-2 offsuit. NOW how gutsy you feeling, chap? [pushes all his chips into the pot] I'm all in you......oh wait, I can't really use that term in the open public forum. Drat...okay, I fold my 7-2 offsuit. Um...anyone else have any Stack the Deck questions? Other than about how horribly I just stacked mine? It's funny I never noticed that extra bit of card protruding below the visible pips. Now that earlier explanation made perfect sense...and I had both jokers, which made a royal straight flush of a kind. Of course it doesn't, but bumping this thread from a year-and-a-half ago doesn't make much sense just to say that. Everyone please remember posts older than 30 days are not to be bumped up. I've read three threads so far today and two of them have been bumped after more than a month.